Naoki: Hi, David. Did you tak pictures? David: I sure did. Naoki, what is this poster? Naoki: It's poster for a rice planting tour. We at the town hall have promoted it every year for the past 10 years. David: You don't use any machines, I see. Naoki: That's correct. It's all done by hand. It's a popular tour. People come from Tokyo by bus to participate. Naoki: Anyone can. It's muddy, so please pick the right clothes. David: Can I take the pictures? Naoki: Let me ask the participants. David: Thank you so much. I'm looking forward do it! Listen again and answer the following question. 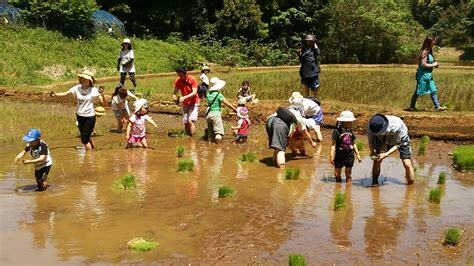 Q: How do you plant rice in the rice planting tour? A: It's done by hand. We at the town hall have promoted it every year for the past 10 years. We have practiced dancing for two months. Everyone has worked hard for the festival since last year. （解答）Paul has practiced swimming for tree years. David: Naoki, what is this poster? We have been here for one hour.